Notes: CHIP = Children’s Health Insurance Program. a. 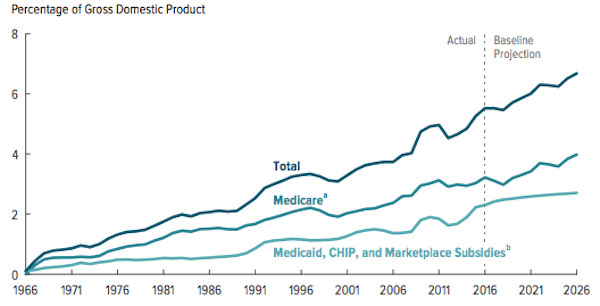 Net Medicare spending (includes offsetting receipts from premium payments by beneficiaries, recoveries of overpayments made to providers, and amounts paid by states from savings on Medicaid’s prescription drug costs). b. Spending to subsidize health insurance purchased in the marketplaces established under the Affordable Care Act and provided through the Basic Health Program and spending to stabilize premiums for health insurance purchased by individual people and small employers. Data Source: Congressional Budget Office (as of August 2016). This entry was posted in Data Watch on December 21, 2016 by Genevra Pittman.